Our first community event to become regular, it is held on the First Sunday of August. A popular event with families and people of all ages. Held under Kennel Club rules, it has four breed classes and eighteen novelty classes. Entry to the showground is free. A small charge is made for class entries. 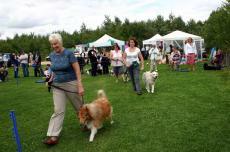 The show may include an obedience demonstration and occasionally other demonstrations including ‘dancing with dogs’. FoCW arrange a game to add interest and there are appropriate stalls to further entertain. Refreshments are available from ‘Tasty Treats’, who cater for a summer event and Prizio’s splendid Italian ice-cream and cool drinks add that extra taste. 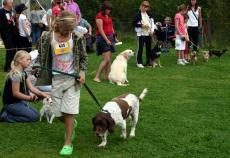 All levels of the Friends ‘Responsible Dog Ownership’ certification scheme are tested at the show. This is a challenge for conscientious owners whose skills can be measured against a progressive learning program. Click here to transfer to the Responsible Dog Ownership page. The show this year is on Sunday, 5th August. Judging commences at midday. Mr Paul Bennett is our judge. The schedule and registration form can be downloaded by clicking here.